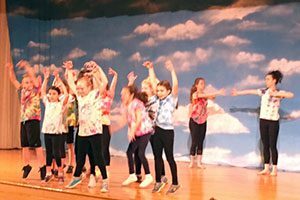 Sanfordville students in all nine Partners in Education (PIE​)​ classes were recently engaged in a “Garden-Inspired Movement Performance​,”​ under the direction of Linda Mensch of The Moving Company in Warwick. 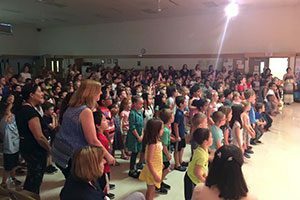 Understanding that children learn in different ways, Sanfordville teachers Nancy Nachtigal and Maripat Barlow-Layne aspired to integrate movement into their students’ curriculum. A grant from the Warwick Foundation for Excellence in Learning (​WFEL​) helped carry out their vision. With music and paper bags as props, Mrs. Mensch began by encouraging students to improvise individual dance movements, evoking the life cycle of plants. These exercises would later inform the choreography of the school-wide performance. 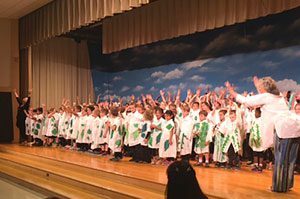 Not only did students create personalized dance movements, they also interpreted and internalized their knowledge of plant life cycles. For children with a passion and aptitude for dancing, the program helped them make new, easier connections to their science curriculum.